Inspired by the true story of a dog named Rip who was the first search-and-rescue dog during the Second World War, Mr. Scraps is a heartwarming story of courage, love and devotion that will appeal to parents and children alike. Bobby, a seven-year-old rescue dog of dubious heritage, lives with his Master and uses his sense of smell to navigate the world. His Boy is missing in action, his Lady has slipped down the rabbit-hole and there’s little excitement in his life. No sooner had his Master told him they were at war than the terror-birds started dropping the egg-bombs that forever change his world. 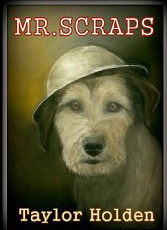 Through Bobby’s perceptive eyes, ears, and nose, the reader experiences the life of a canine victim of war. Alone and terrified, he encounters only death and fire-stink until he is befriended by a scab-kneed boy called Lawrie who names him Mr. Scraps, and Harry, a fireman who realises how useful he could be. In a daily game of seek-and-reward Mr. Scraps becomes the first ever search-and-rescue dog. Between them, he and Harry find more than three hundred dead or dying and are almost killed in the process. After the war Mr. Scraps is awarded the Dickin Medal (the animal equivalent of the Victoria Cross).